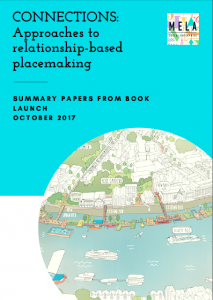 In 2016, MELA published a book called Connections: 12 Approaches to relationship-based placemaking. It was a collaborative effort in which 12 MELA Associates explored their own practice in building connections between people from diverse backgrounds; between people and the places they live; and between people and professionals. Three major themes ran through the chapters which were explored in more depth at the Connections book launch in October, 2017.